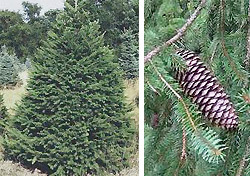 Colorado Blue Spruce - Picea pungens: 75' to 100' tall. 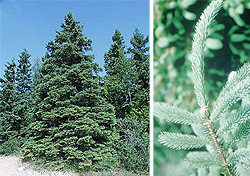 Stiff short needles of this dense evergreen are bluish green to bright silvery blue. Moderate to slow growth in silt & clay loams, full sun. 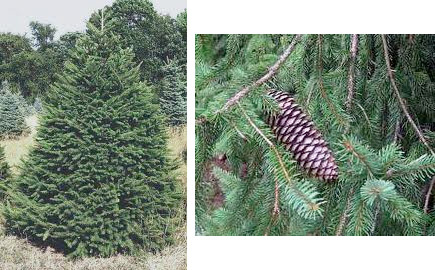 Norway Spruce - Picea abies: 60' to 90' tall with pyramid-shaped crown. Stiff short needles. Fast growing in well drained to somewhat poorly drained clay to loam soil. Full sun, can tolerate some shade. 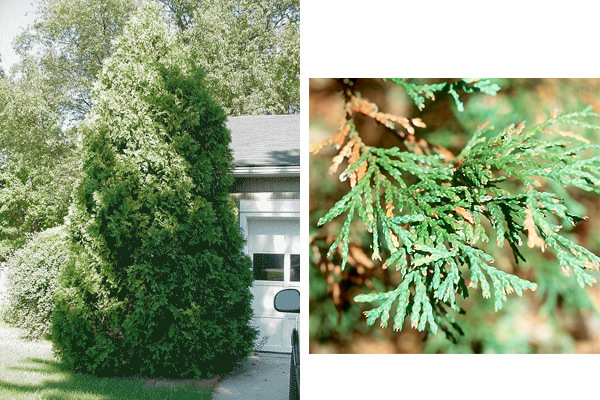 White Cedar - Thuga occidentalis: Can grow to 50' tall with 10' spread full sun, average well drained soil. Takes well to pruning. 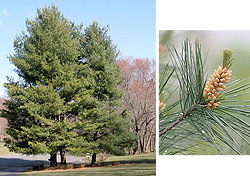 White Pine - Pinus strobes: 75' to 100' tall in well-drained sandy to clay soils. Less tolerant of shade with age. Long needles, fast growth rate. Long soft needles. Native. 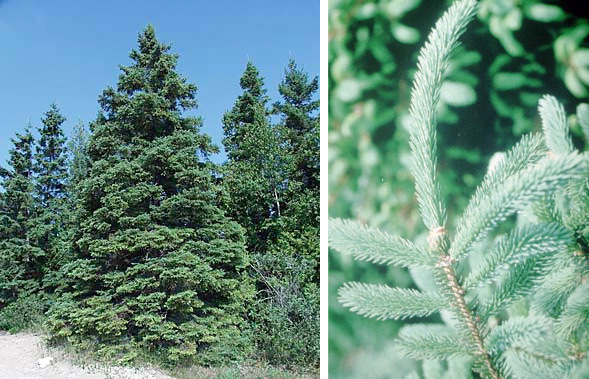 White Spruce - Picea Glauca: 75' to 100' tall. A dense pyramidal tree widely used in hedges and windbreaks. Fast growing in well drained to somewhat poorly drained clay to loam soil. Full sun, can tolerate some shade. Redbud - Cercis canadensis: It has long been a favorite as a landscape tree with perfect, reddish purple flowers in bud, opening to a rosy-pink flower in April. 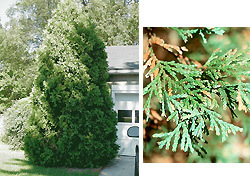 Usually a small tree 20 to 30’ tall with about the same spread. The trunk is divided close to the ground forming a ,flat-topped to rounded crown; very handsome with its gracefully ascending branches Medium growth rate. 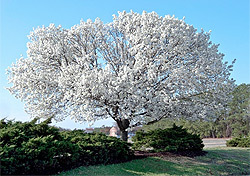 Transplant as a young tree in spring or fall into moist, well drained, deep soils. However does exceedingly well in many soil types except permanently wet ones. Full sun, light shade. 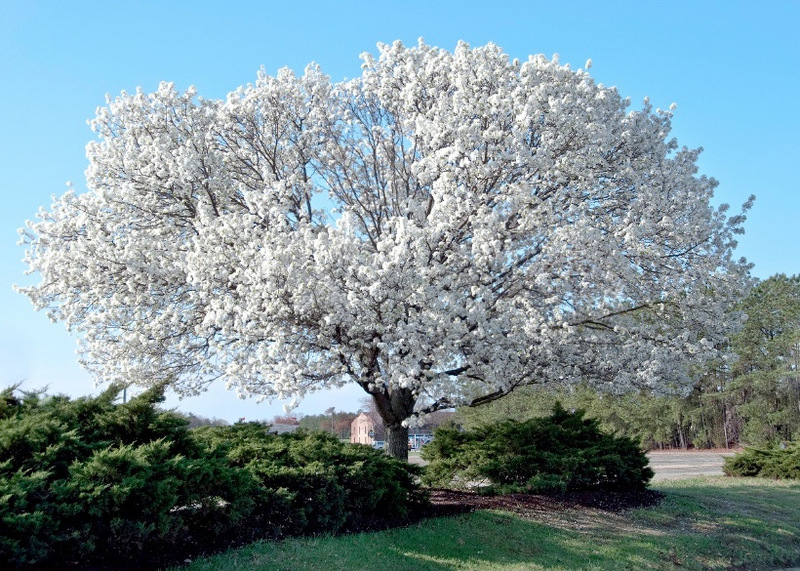 White Flowering Dogwood - grows naturally as an understory tree, a small deciduous tree, grows to about 30' tall with an equal or greater spread, shape is rounded to somewhat flat-topped, branching is approaching horizontal, branches low to the ground with a short trunk. Opposite, simple leaves, oval to ovate shape, leaves 3" to 6" long, leaves 1.5' to 3" wide, leaf color is medium green Autumn Foliage red or reddish purple, generally quite showy, colors early and color holds for an extended period. Flowers are small and yellowish green ,the showy part of the bloom the four white bracts ,each bract is nearly 2" long, the diameter of the bracts combined is about 4" across, bloom time is mid-May ,bloom is effective for 2 weeks ,flowering occurs before leaf out. Fruit bright, shiny red, held in tight clusters of 3 to 4, each fruit is elongated, some trees retain fruit into the winter, birds often eat the fruit. Bark quite attractive, develops small square or rectangular blocks, resembles alligator skin, color is dark gray, brown or black Prefers a cool, moist, acidic soil that contains organic matter. Full sun promotes greatest flowering but tolerates partial shade well, not tolerant of stresses such as heat, drought, pollution, road salt, best transplanted at a small size, can be slow to reestablish following transplanting. 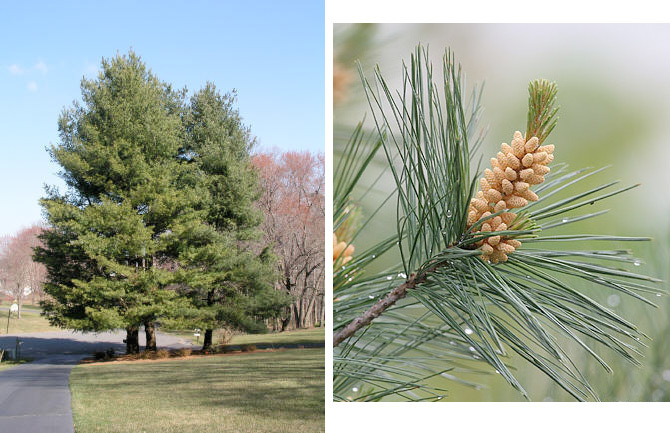 Landscape uses, small groupings ,lawn tree, specimen, border, naturalistic areas, edge of woods, patio tree, has four season appeal in flowers, fruits, fall, color, bark and branching character.